HEAVY April showers, which included a vicious hail storm for good measure, punctuated the afternoon at Stafford Cross which featured a second double of the weekend for Will Biddick. After two successes at Woodford on the previous day, Minella Fifty took the champion jockey to the 30 winner mark in his quest for a third successive title when making all to win the Mixed Open at his leisure in the colours of Exmoor based owner/trainer Claire Hitch. Fresh from receiving his jump trainers’ trophy at Sandown on the previous day, Nicholls watched his 16-year-old daughter, Megan, win the Novice Riders’ event on Join Together. Rose Loxton now handles this ex-Nicholls inmate for owner Wendy Fogg, and the nine-year-old exuded class to defeat Barneys Mate (Philip Miller) and Francis du Mesnil (Lucy Mager) in a good finish. 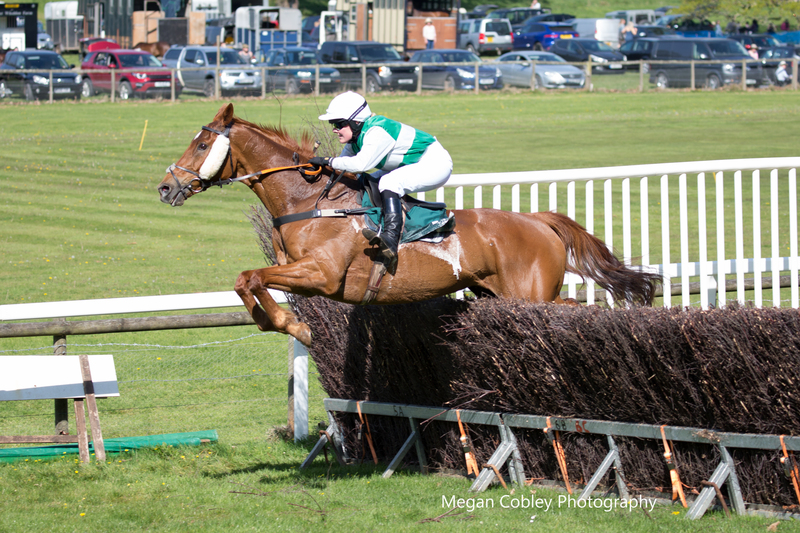 Megan is battling with Katy Lyons for the National Lady Novice Rider title, and bounced back from a nasty fall on Easter Monday to ride her 8th winner of the season here. Ed Walker saddled the first two winners on the card in Minutes Later and Level Spirit. Danny Burton was paying his first visit to the track and partnered Minutes Later to win the Hunt race for Ross Willmington, a joint master of the Axe Vale, and Alistair Holder. “This is my first horse and first winner. We bought him at the hunt Christmas auction at Branscombe village hall for a bit of fun,” laughed Ross. Jockey Danny Burton is based with Alan King and was riding his second winner of the campaign. Robbie Henderson has been chasing Will Biddick hard for the National Men’s title, and Level Spirit became his 22nd winner of the season when just mastering the favourite Notus de la Tour in the Confined. A winner of three of his five races this season for the Otter Club syndicate, nine-year-old Level Spirit was described by his trainer as, “Really tough. It was too tacky for him last time at Upcott Cross.” Biddick has extended his National title lead this weekend such that his challenger confessed, “I have no chance of catching him now.” With seven weeks of the season left , maybe Robbie has been taking mind games tips from the Chelsea football team manager. Bryony Frost rode her 9th winner of the season when getting Brackenwood, trained by her mother Nikki, home in the Intermediate. David Prichard made a bold bid to steal the race on the mare Roseyroo, but after a neck and neck battle on the long run-in, Brackenwood just got his head in front where it mattered. “Bryony got him into a nice rhythm and he is a genuine horse,” remarked Bryony’s father Jimmy Frost. “He is home bred and was difficult as a youngster and Jamie Thomas did a good job with him when he worked for us,” added Jimmy. Nikki Frost just missed out on a training double when Donpierre (Ben Robarts) was narrowly denied by Midnight Breeze (Ceiran Gethings) in the Restricted. A lightly raced eight-year-old by Midnight Legend, the winner was bred by his owner Helen Stoneman and is trained by Ollie Bush. “He is the last produce of Fly the Wind and has not been the easiest. He has needed lots of patience and I have nursed him all along,” said the owner. The successful jockey, 19-year-old Ciaran Gethings, shows much promise and is beginning to get rides under rules for his employer Philip Hobbs. Brackenwood (9-4 into 7-4) and Roseyroo ( 6’s to 9-2) were nicely backed before fighting out the finish of the Intermediate. They finished well clear of their rivals and the form looks solid enough. Donpierre had caught the eye in finishing fourth on his English pointing debut at Upcott Cross (my official SP 40-1 that day). The Nikki Frost trained gelding was offered at a very tight 7-4 here before easing to a more realistic 11-4 (3-1 in places). He is a winner in waiting but had to give best to the determined Midnight Breeze in the Restricted (3-1 and 100-30). Interest in the Open Maiden centred on the previously unraced four-year-old The Eaglehaslanded. The combination of Paul Nicholls as his owner/ trainer and Will Biddick as his jockey sent the bookies into a frenzy and 1-2 was immediately chalked up. With none of the big hitters prepared to invest, 4-6 and 8-11 became available before the off. The Nicholls gelding readily obliged, but the five-year-old runner-up Garden Whispers (20’s to 10’s) stayed on really well to finish second and Golden Squirell (12’s to 4’s) was far from disgraced in third. 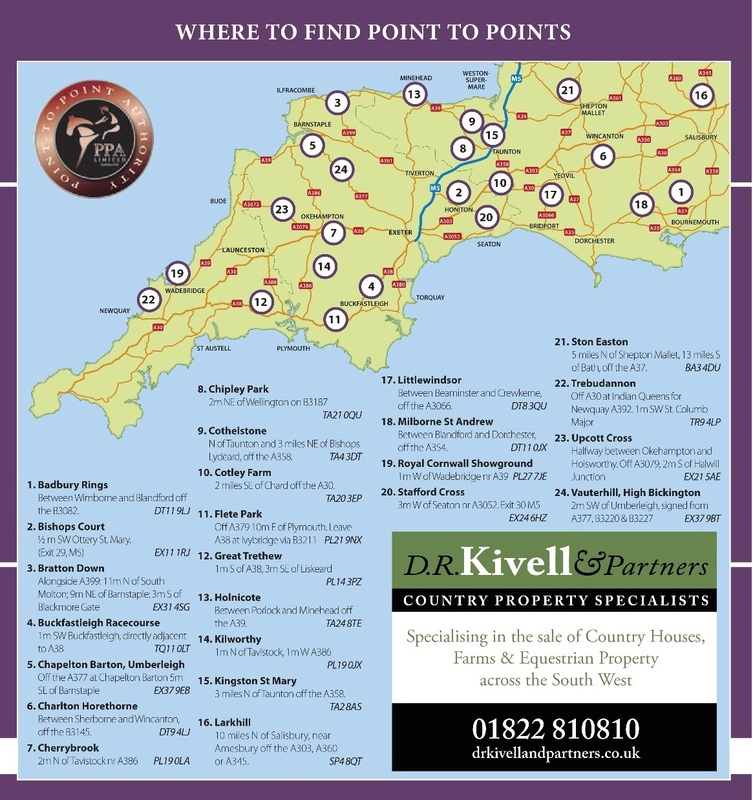 Saturday 3rd May, Modbury Harriers Point-To-Point & Pony Races, Flete Park (near Ivybridge). 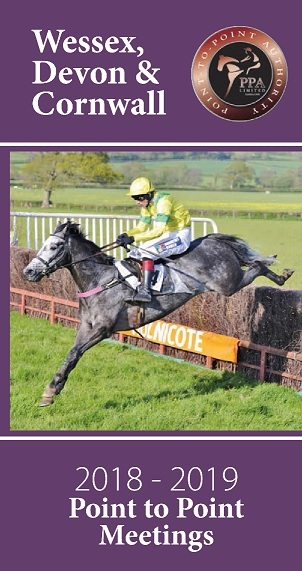 Monday 5th May, Stevenstone Point-To-Point, Vauterhill (near Torrington).